Success Resources will be hosting its first every UK Women’s Achievers Congress, created around the aim of inspiring, empowering and helping women succeed. This event will be featuring some of the greatest female motivational speakers and entrepreneur in the world, with Kim Kiyosaki as the headliner. After huge success in USA and Singapore, it was time to bring it for the audience of United Kingdom. Event attendees will learn how to become financially independent, grow their businesses and build a solid understanding of financial processes. With currently trending topics about equal rights and equal pay for both genders, the panel of speakers will be a great addition to this contemporary British discussion. 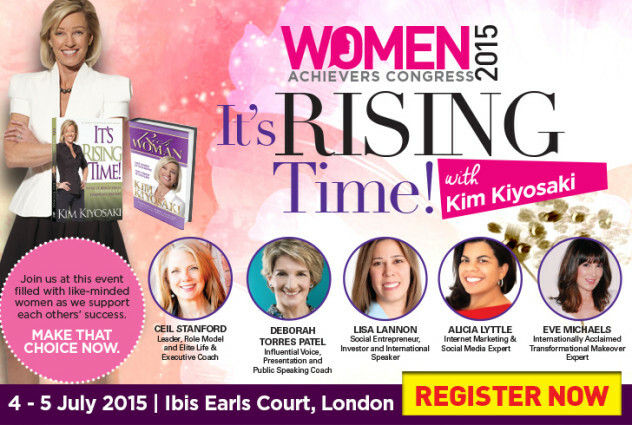 We are bringing Kim Kiyosaki, who is a major ambassador of women worldwide. Kim Kiyosaki loves the phrase from “Wife” magazine-“A man is not a financial plan”. She highlights the importance of financial freedom, wise investments and ongoing education for women around the world. Kim Kiyosaki is an author of world famous books “Rich Woman”, “Its raising time”. She appeared on a numerous TV shows and as a host of “Rich Dad” TV programme. Since 1992, we have supported individuals, enterprises and organizations through educational programs around the world, impacting the lives of hundreds of thousands from more than 35 countries. We continue to help them live, learn and succeed not solely for their personal fulfilment but also to share their experiences to grow future generations. Kim Kiyosaki will be accompanied by other speakers who are experts in their own fields (This will be confirmed through our website). There will also be opportunities to meet our panel of speakers, ask them questions and there will also be a book signing. Please check our website for more information or to book this life changing event.